Non-destructive Testing (NDT) and the Automotive Industry go hand in hand. The automotive industry spans a wide range of corporations that involves the marketing, development, and manufacturing of motor vehicles. Motor vehicles serve many functional roles these days. They also serve to drive our desire for adventures, long journeys, road trips and exploration. Motor vehicles have made our lives easier. Travelling, going to work, and driving children to school over long distances is now commonplace. We take for granted, the safety a modern motor vehicle provides and we place little thought into the advanced testing each one has undergone prior to, during and after production. Lesser still are any thoughts to the little-known process called non-destructive testing or NDT. During the production and testing of a vehicle, engineers can calculate approximations of wear and breakage of vehicle components. Ultimately these parts must be assembled and tested. Many tests occur on individual components prior to the assembly of a vehicle, and many tests occur after the assembly is complete. It is when something breaks down, or becomes defective that a measure of that defect must be taken. A non-destructive technician will then perform an inspection primarily for data collection. This data then aids an engineer to redesign the component to ensure greater longevity or safety. The use of NDT results is helpful to the outcome. Within the long history of motor vehicle development, the internal combustion engine has been a particularly complicated endeavor. Originally designed to burn coal, oil, and wood for inducing internal pressures causing the forward motion of a vehicle, the engine has evolved to run on fossil fuels or pure electricity. The internal combustion engine did not evolve overnight. NDT in some form has always been used to measure the efficiency, by degradation, from one prototype to another. In 2009, the American Society for Nondestructive Testing (ASNT) hosted a topical conference on Automotive Industry Advancements with NDT. This conference covered many production level challenges. From a piston to any other critical component of a vehicle, NDT methods have enabled engineers to improve our vehicles over the years. As a cost-effective component of any quality assurance program, liquid penetrant, radiography, and other NDT inspections perfectly satisfy the needs of the global automotive industry. As consumers demand improvements to existing technology, there will always be a need to test a vehicle and its components to their limits. For engineers to expand beyond design limits, they depend upon non-destructive testing to measure wear patterns through inspections. For many reasons, the automotive industry is highly motivated to improve quality. Engineers continue to push through previous design limitations as competing corporations pursue the majority market share. The industry will continue to invest in quality initiatives. Product liability issues will continue to cause expensive recalls. Advanced processes, such as NDT, are in demand in the automotive industry. Ultimately the automotive industry must meet increased environmental protection regulations, safety regulations, and the consumer-driven demand for technological advances. Manufacturer recalls are extremely expensive. Vehicle producers would rather spend money on quality assurance during production than a recall after. The outcome is an array of choices for consumers who expect safety and performance. We take for granted the safety a vehicle provides, but this is in the design as NDT and the Automotive Industry ensure we can all drive together to any destination, safe and sound. For additional information on Nondestructive Testing and the Automobile industry our suggested reading is from G. Mozurkewich from the Ford Motor Company. His general abstract is as follows. G. Mozurkewich’s complete document, with references, can be found here. Have you ever heard of rope access? I bet you’ve seen it several times in your life. Did you know that you ... Read more! Non-destructive Testing (NDT) and the Automotive Industry go hand in hand. The automotive industry spans a ... Read more! Fine Art and Nondestructive Testing (NDT) may seem unlikely companions. The current paradigm of NDT focuses ... Read more! When it comes to Quality Systems and Standards, we have all become reactive. A new Standard is published, and ... Read more! Safety and quality programs within the oil and gas industry are often mandated by government code, law or ... Read more! Success in the field of Nondestructive Testing requires knowledge of a wide variety of documents. There are ... Read more! It is important that you have a ... Read more! If you haven't seen the documentary "Read more! 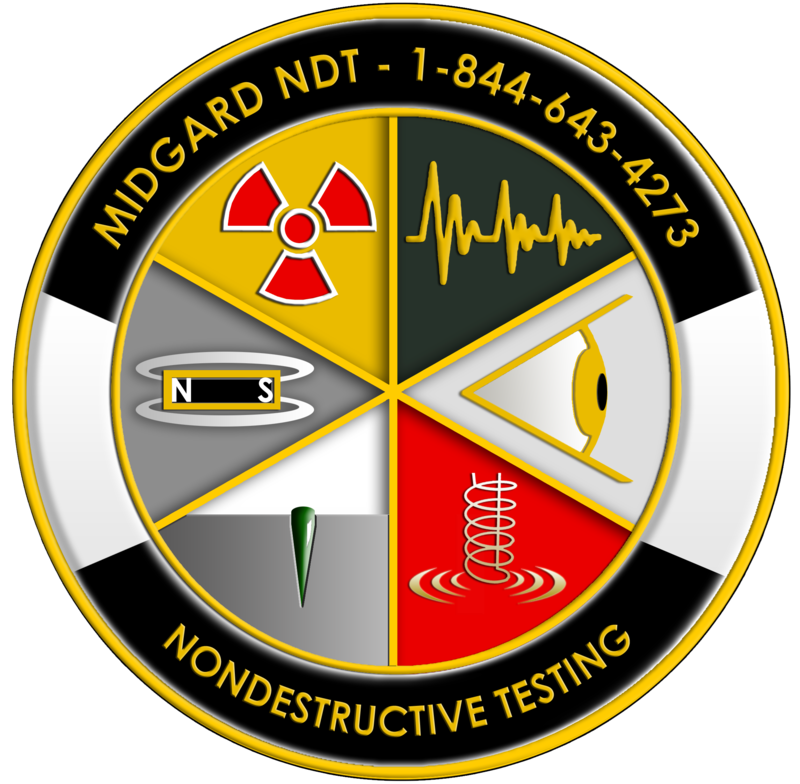 Midgard Scientific, LLC is fully DICONDE ASTM E07.11, ASTM E2339, ASTM E2663, ASTM 2767, ASTM E2699, ASTM ... Read more! In the grand quest for the perfect Nondestructive Testing and Eddy Current Array solution, Eddyfi has ... Read more! It’s tough to read the news these days without coming across an article discussing how the cost of going to ... Read more! © 2016 Midgard Scientific, LLC All Rights Reserved.